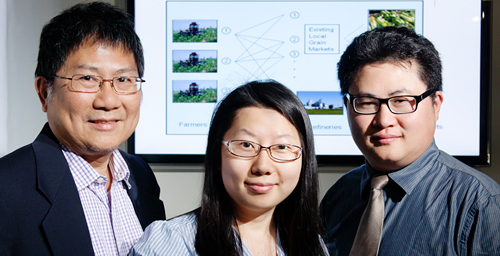 Illinois researchers - from left, Jong-Shi Pang, Yun Bai and Yanfeng Ouyang - developed models for optimizing and evaluating the biofuel feedstock supply chain, addressing layers of competition not only between the biofuel market and the food market, but also among individual farmers. CHAMPAIGN, Ill. - As biofuel production has increased - particularly ethanol derived from corn - a hotly contested competition for feedstock supplies has emerged between the agricultural grain markets and biofuel refineries. This competition has sparked concern for the more fundamental issue of allocating limited farmland resources, which has far-reaching implications for food security, energy security and environmental sustainability. Numerous studies of land use, food prices, environmental impact and more have fed the so-called "food versus fuel" debate. However, according to new models created by University of Illinois researchers, most studies so far have overlooked a key factor: selfish and possibly competing interests of the biofuel industry and individual farmers, who independently seek the most profit from their crops. "We looked at competition among farmers and between the refinery and the food market and put them into one model to optimize the whole system," said Yanfeng Ouyang, a professor of civil and environmental engineering. "A lot of researchers now working on biofuel supply chain optimization have not been able to develop a holistic model that can address such complex interactions among multiple stakeholders in a comprehensive framework." Most such studies have assumed that farmers act collectively or in corporation, but in reality each farmer is competing for his own market share. Farmers individually have a choice to sell to the grain market, to the refineries or to some combination of the two, based on the price at each outlet and the cost of transportation. Furthermore, refineries have finite capacities, so farmers are competing with each other to sell to them. The grain market, too, has its limits: If the grain market is flooded with excess corn, prices drop. In turn, refineries can then offer lower prices for ethanol corn. "At the end of the day, how much a farmer produces to sell to the market depends on the market price of the corn," said Jong-Shi Pang, the Caterpillar Professor and the head of industrial and enterprise systems engineering at the U. of I. "The farmers need to take into account what the refinery is offering to them but at the same time also be mindful of their production. The amount sold to the market determines the price on the market, which in turn influences everyone's production. Those are the kind of decision-making problems that all the players have to resolve." Taking these complicated competing interests into account, the U. of I. team developed models of the system, using corn production and sales in Illinois as a case study. They published their findings in the journal Energy Economics. The models provide guidelines for optimizing the biofuel supply chain - where to place biorefineries and what capacities to assign them to maximize profit. The researchers considered the delicate balance such refineries must strike: Pay the farmers enough to persuade them to sell, but not so much that it cuts into their own profits. Location and price are two important factors guiding a farmer's decision to sell to the refinery. The researchers also used their models to quantitatively evaluate the effect on farmers and food prices when a biofuel supply chain is introduced to a market. They found that diverting some of the corn crop to ethanol affects food prices to varying degrees. However, the overall system welfare improved, with farmers being the primary beneficiaries. "We do see that the competition is likely to bring benefit to the farmers," Ouyang said. "The farmers used to have to sell to the grain markets; now they have more alternatives. They can do further bidding and negotiating." The researchers will continue to refine their models, adding additional considerations such as environmental impact, production fluctuations, land-use diversity and crop rotation. They also hope to design mechanisms to drive self-interested stakeholders toward socially desirable business practices. Graduate student Yun Bai was the lead author of the paper. The National Science Foundation supported this work. Editor's note: To contact Jong-Shi Pang, call 217-244-5703; email jspang@illinois.edu. Yanfeng Ouyang: 217-333-9858; yfouyang@illinois.edu. The paper, “Biofuel Supply Chain Design Under Competitive Agricultural Land Use and Feedstock Market Equilibrium,” is available online.